Historically the suite of Certificates in Mine Environmental Control issued by the Chamber of Mines of South Africa was designed and was accepted by the South African Mining Industry, including the various Governmental Mining Authorities through to the present, as a key and fundamental qualification to promote health and safety in the Industry. 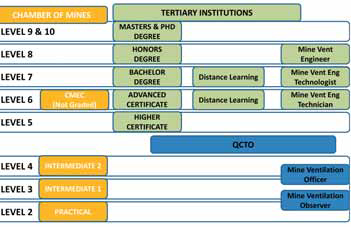 It is a fact that the current Chamber of Mines qualifications are recognised by South African mining operations. With the globalisation of companies and mobility of professional in the last decade, professionals in this and other similar specialised areas had to “prove” their knowledge skills and worth of their qualifications since these were not issued by a formal (and recognised) educational institution. In addition, the transformation of the current qualifications into formally recognised educational credentials would open the door to registration of professionals with the Engineering Council of South Africa. With the adoption of a new Constitution and formation of new governmental administrative systems, a number of changes have come about. One in particular, through the ratification of the South African Qualifications Act (Act 58 of 1995) and the establishment of the South African Qualifications Authority (SAQA), required the formalization of ALL qualification under a common standard framework: The National Qualifications Framework (NQF). The South African Qualifications Act makes provisions for the institution of Sector Education and Training Authorities (SETAs) charged with devising the qualifications, assessment tools, requirements for the registration of training and assessment service providers and the listing of the assessment criteria. The Mining Qualifications Authority was established as the SETA for the mining and minerals sector as entrenched in the Mines’ Health and Safety Act (Act 29 of 1996). Therefore, for the qualification to carry national recognition it should be issued by an accredited qualification body, the SETA. In this scenario and in due time, the Chamber of Mines (COM) will no longer be responsible for vesting the qualifications in “Mine Environmental Control”. The Mine Ventilation Profession had to be aligned with these requirements to register these qualifications within the National Qualification Framework (NQF) as established under the National Qualifications Framework (NQF) Act (Act 67 of 2008). 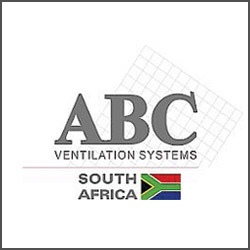 In 1998, the Mine Ventilation Society of South Africa (MVSSA) was a signatory, together with several other mining professional associations, to a memorandum of understanding devised to assist the MQA in the registration of mine-ventilation related qualifications that would substitute the Chamber of Mines certificates. The journey started in 1998 was fraught and followed by numerous administrative and bureaucratic delays. To this, it must be added the fact that the Chamber of Mines has wanted to divest itself from the responsibility of administering these qualifications and is not interested in registering as an education and training authority. It is thanks to this change that there is a renewed motivation to resolve this impasse. It is stressed at this stage that the MVSSA has dedicated a considerable effort, both in terms of human resource capital and financial investment, to participate and stimulate the numerous initiatives that have taken place over the last fifteen years. This resolve has not flagged and has resulted in the MVSSA being recognised, together as the Chamber of Mines’ Group Environmental Engineers (GEE) as the custodians of all qualifications related to mine ventilation engineering. Today, seventeen years later and also following a number of radical changes within the South African education and training environment, the MVSSA, jointly with the GEEs, formally assist the MQA, who is the recognised Assessment Quality Partner (AQP) by the QCTO (Quality Council for Trades and Occupations, established under the Skills Development Act, Act 97 of 1998, amended in 2008) for establishing, registering and administering qualifications (registered up to Level 4 for mine ventilation) under the NQF. The MVSSA originally applied to fulfil this role, but due funding considerations, the function was assigned to the MQA with the condition and understanding that the MVSSA and the GEEs will provide the required expert input. On the 22 November 2013 the MQA, Chamber of Mines and the MVSSA met to plan the implementation of the AQP for mine ventilation. Under the QCTO, the MQA and guidance from the MVSSA, two mine ventilation qualifications were designed: the Mine Ventilation Observer and the Mine Ventilation Officer. 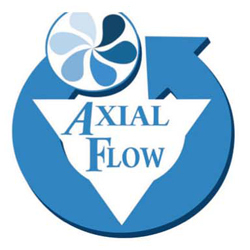 The first consists mainly of the current practical syllabus and part of Intermediate Paper 1. The second qualification is made up of the remainder of Paper 1 and of the Paper 2 syllabi. Changes made included stone dusting, gravimetric sampling and radiation protection. These qualification have been designed to allow individuals to practice in all mining commodities – provided that the requirements applicable to that specific commodity are also included. The two qualifications were submitted for registration on the National Qualification Framework (NQF) in the last quarter of 2013 and were duly registered in 2014. Another aspect that comes into play is the change in the South African Higher Education administration and the registration of academic qualifications under the Higher Education Qualification Framework (HEQF). Post matriculation certificates, higher certificates, diplomas, and higher diplomas, undergraduate and post-graduate degrees may only be registered by tertiary institutions such as universities and colleges for higher education. An analysis of the current Certificate in Mine Environmental Control has revealed that it can be registered, with some additions, may be registered as a Level 6 qualification or as a higher certificate. This has two advantages: the courses and qualifications may be offered by local universities and upon achieving such qualification and fulfilling a stage two competency (structured and assessed on the job training) individuals would be able to register with the Engineering Council of South Africa (ECSA) as Technicians. Professional registration with an internationally recognised Body Ability to continue studies within tertiary institutions towards a degree while having credits for some of the subjects. This solution has been selected in recognition of the fact that the vast majority of professionals in this discipline are likely to undertake a distance learning option while retaining a junior position on a mine. In the long term this balance may swing in favour of a full time bachelor of engineering degree. To complete the picture, some universities will be offering B.Sc. Eng. degrees with mine ventilation as an elective discipline. Graduates who choose this full-time stream degree option would be registering with ECSA as engineers in training and will be eligible to attain their Pr. Eng. registration after graduation and a similar stage 2 competency assessment. Therefore, under the new framework there will be two routes for the qualifications that will supplant the current equivalent Certificate in Mine Environmental Control, namely, full time attendance at a Tertiary Institution for a B.Sc. degree in engineering or distance learning through a university or technical college for an Advanced Certificate. A suggestion from the tertiary institutions is that there will be a generic B Sc. engineering qualification (Level 7) as part of a three year course in which the first two years will consist of generic mining engineering subjects and the remaining eighteen months (prior to the thesis preparation) will be dedicated to specialised studies in ventilation engineering topics. Discussions are being undertaken with higher education institutions that will offer such courses and qualifications after which details of the study material would be prepared in collaboration with the MVSSA and GEEs. In the interim, the Chamber of Mines (COM) will continue to administrate these qualifications until the new ones are in place. In the longer term the MQA, assisted by the MVSSA and GEEs will administrate the two Level 4 qualifications while the relevant tertiary institutions will administer the Level 6 advanced certificate and Level 7 (and higher) degrees. The current position regarding the Chamber of Mines qualifications is that they will remain in place until the new system is finalised and registered. Similarly, the legal status of the qualification will remain unchanged under the current legislation. Future engagement is envisaged with authorities to ensure a transition to the new qualification without compromising the holders of the current certification. Last examination for certificate candidates is October 2018 Students are urged to continue studying to attain the qualifications currently on offer.